Ever-green Dean Lewington shows no signs of letting up as he approaches his 700th MK Dons appearance this weekend. This week marks a year since Lewington’s return to the club after he was exiled by former boss Robbie Neilson. Immediately thrust back into the action by Dan Micciche, Lewington has missed just three games since. 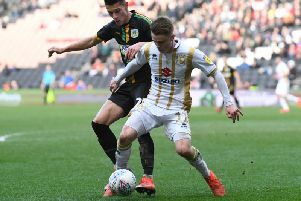 Not one for the pomp and circumstance of landmark achievements, Lewington made his 600th league apperance for MK Dons during Saturday’s 1-0 defeat to Crewe, while his 700th club appearance could come this weekend away at Grimsby - the same opposition he faced in one of his career highlights: the 2008 Johnstone’s Paint Trophy final victory at Wembley. The 34-year-old, out of contract in the summer, has been Dons’ left back since the club moved in 2004, with many coming and going behind the skipper. Youngsters Adam Chicksen and Ben Tilney showed promise but struggled to make a real impact to get first team action, forcing them to seek pastures new. Even a promotion in Paul Tisdale’s preferred formation, pitching him into midfield, has offered little opportunity to those waiting in the wings for a chance to play on the left-hand side. Tisdale has even sought loan options for Mitch Hancox to get him some game time this season. But there seems to moving the immovable object yet. “Having arrived here in the summer, if there were any doubts in my mind about him and how he managed it, I’ve now seen it and understood it,” said Tisdale. “Physically, he’s robust, mentally very capable and then he delivers on the pitch.